Mind games: A shot of the advertisements that were splashed in almost all leading newspapers on Monday and Tuesday. Mumbai: A controversial series of front-page advertisements by the Reliance Anil Dhirubhai Ambani Group (R-Adag) is the latest salvo in a bitter corporate battle that has snowballed into a national controversy. Almost all the six lawyers Mint spoke to said the advertisements were an unprecedented exercise in mobilizing public opinion but were divided on whether they violate judicial protocol or stop short of doing so. They said the campaign could invite censure from the judges but a “contempt of court" or a gag order was unlikely. R-Adag ran front-page exhibits on Monday and Tuesday in nearly three dozen publications, including Mint, alleging the Union ministry of petroleum and natural gas was, because of its policies, forcing state-owned utility NTPC Ltd to suffer Rs30,000 crore losses while garnering huge “super-normal profits" of Rs50,000 crore for Mukesh Ambani-owned Reliance Industries Ltd (RIL). 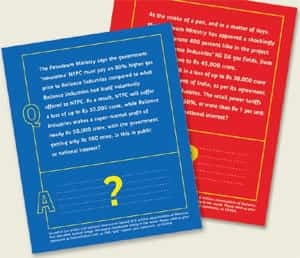 The advertisements also claimed the ministry was allowing RIL to get away with a 400% hike in the capital spending plan in the D6 block of the Krishna-Godavari basin, where it has struck massive natural gas reserves. These advertisements come just before the case is to be argued in the Supreme Court on 1 September, the endgame in a long and bitter three-year legal battle. “The release of the advertisements completely demonstrates the fact that Reliance Natural Resources Ltd (an R-Adag firm) is indulging in an orchestrated campaign intended to bring into public debate and prejudge the issues that are pending adjudication before the honourable courts," said an RIL spokesperson, reiterating the firm’s stance that it will present its arguments only before the court. Union petroleum secretary R.S. Pandey declined comment, while petroleum minister Murli Deora did not respond to phone calls or to a message left with his assistant. Reactions from legal experts were varied. “R-Adag is certainly treading the line of contempt (of court) but not exactly crossing it," said Samar Bansal, a practising lawyer in the Supreme Court (SC), adding that anything the courts believe interferes or tends to interfere in the administration of justice could qualify as “contempt". He explained that “contempt" was an issue of subjective assessment by the judges, but at some point such a massive public campaign could “draw a rebuke or even a caution", since the exercise was “somewhat unwise". Some others were less forgiving. “The ads have just crossed the limit. This is becoming too much," said a New-Delhi-based lawyer practising in SC and Delhi high court, who did not want to be identified. RIL’s counsel Harish Salve, when contacted by Mint on Tuesday, declined comment, but a fortnight ago Salve had said, “There is a limit to which a case should be reported. It has drifted into a media campaign and at some point, the SC is going to take it seriously." The advertising campaign is likely to be continue for some time. According to R-Adag officials and media executives, R-Adag printed its ads on the front pages of 35 publications—the Mumbai and Delhi editions—and television advertising cannot be ruled out either, with a possibility of the print campaign being extended. At least 7-10 print ads—a new one for each day—are with some publications and these will be printed in the next few days, said the sales head of a publication who did not want to be identified, given the controversial nature of the dispute. The total spending could easily touch Rs15 crore, said the media executives. RNRL is in the apex court claiming 28 million cu. m of gas a day from RIL for 17 years at a price 44% lower than government-specified price, basing its rights on a 2005 family demerger pact. RIL says it can’t give gas to anybody without government approval—a stance the oil ministry backs. Nikhil Mehra, a New Delhi-based SC lawyer, said this was arguably the first instance of a company using a massive campaign to rally public opinion in a contractual dispute, but reiterated that the courts took such public outcries far more seriously in criminal matters. RIL, at least at one point, considered filing a petition against such public outcries by R-Adag but later dropped the idea, said a lawyer familiar with the development who did not want to be identified. R-Adag’s lawyer Ram Jethmalani is no stranger to such media campaigns. In 1987, he put out 10 daily questions for then prime minister Rajiv Gandhi in a national daily on the Bofors scandal when he was representing the Hindujas. He had also made the sensational claim to reporters while representing Mumbai broker Harshad Mehta that the latter had bribed then prime minister Narasimha Rao. Jethmalani could not be reached for comment but he told news channel CNBC TV18 he did not deem the campaign improper, saying, “On matters of public interest, the law is that merely because litigation is pending, it is not sufficient to suppress public debate." One legal expert, though, said R-Adag could be legally safe, but some of its statements were “fraught with risk". Utpal Bhaskar and Anushree Chandran contributed to this story.